Today I've got some more super sweet cards from the swap featuring products from the spring mini. Once again, don't forget that the mini only lasts until the end of the month, so if you fall in love with something don't wait to get it! 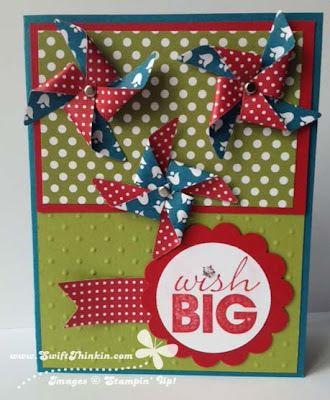 The first card I have was designed Deb Klaphake- and it features pinwheels! Do you remember running with pinwheels as a child? I sure do, so this brings back lots of summer childhood memories for me :) And these pinwheels are super easy to make with the help of the pinwheel die for the big shot. How fun!